The 2010 edition of the Cabrillo Festival of Contemporary Music is wrapping up tonight. Led by the brilliant music director Marin Alsop, this is always a highlight of the Northern Californian summer. This year proved no exception. The first weekend was highlighted by a concentrated look at two composers: Jennifer Higdon and Mark-Anthony Turnage. Both composers were introduced to me at earlier Cabrillo festivals. Higdon has been a particular favorite, so it was a great delight to hear two concertos: her concerto grosso for eighth blackbird, On a Wire, and her Percussion Concerto performed by Colin Currie. The Percussion Concerto might be my new favorite of the Higdon works that I have heard performed live. The writing where the percussion soloist was halo-ed by the percussion section was particularly evocative. There seems to be a lot of concerto grosso in the air at Cabrillo these days. The eighth blackbird concerto of course is in this idiom with a sextet of soloists, but the halo percussion parts in the Percussion Concerto and the halo soloists in last year’s Azul cello concerto by Osvaldo Golijov are pretty close relatives. Although I liked Turnage’s Riffs and Refrains clarinet concerto two years ago, other works of his have not had the same effect. His opening Scherzoid this year fell into this category – it was fine, but I didn’t find it particularly compelling listening. But when you get to hear three works by a composer in two nights, it makes it easier to find your way into their language. Midway through Chicago Remains in the second concert, I had an “ah-hah!” moment where the musical language started to make a lot more sense to me, and my listening became much more involved. I then thoroughly enjoyed the concert-concluding Drowned Out. Thanks to Marin for such great programming – and, of course, for conducted such inspired performances of these works. Last night’s concert featured John Adams‘s most recent orchestral work, City Noir. The Cabrillo Festival Orchestra fielded 16 extras for this one, including San Francisco Symphony principal trumpet Mark Inouye on second trumpet. It was well worth it! This score sounds quite different from the other orchestral works by Adams that I have heard – even denser with musical ideas than before, and with a rather different treatment of rhythm. It also sounded crazy difficult, with a lot of tricky lines at fast tempos. While I enjoyed the performance tremendously, this is definitely a piece I will need to hear more to absorb. And as one of the orchestra members said at the post-concert reception, it’s the type of work that you would like to play multiple times in a subscription setting to really dig into it. The other special highlight of the concert was Kevin Puts‘s piano concerto Night, with the composer as soloist. Even though Mr. Puts was introduced by Marin as being a festival favorite, somehow I’ve missed his past compositions. I’ll try not to repeat that mistake in the future. This was a beautiful concerto that makes me eager to hear more of his music. As usual, there were many shorter pieces in the concerts that served to introduce composers new to the festival. Anna Clyne, Sean Hickey, and Michael Shapiro all offered attractive and interesting compositions, and once again whetted the appetite for more of their music. This year I believe that all the composers being performed were present at Cabrillo, which I think is a first for the festival. One of the joys of Cabrillo is being able to talk to the composers and performers about their music and experiences. At intermission last night, I introduced myself to John Adams and told him how thrilled I am to be performing El Niño with him in December as a member of the San Francisco Symphony Chorus. He asked what part I sang; when I answered “tenor”, he seemed to wince a little and mentioned that “I write pretty high for tenors.” We’ll see how it compares with Der Freischütz – but it’s a lot different singing with a large tenor section compared to the 6-voice section we’re limited to at West Bay Opera! In general I’d rather have a composer write pretty high for tenors than pretty low, but I’ll know more after our first rehearsal next month. Executive director Ellen Primack and development director Tom Fredericks received many accolades and honors before the opening concert to honor their 20 years with the Festival. I haven’t dealt directly with Mr. Fredericks, but ever since singing in the chorus of the Bernstein Mass at the 1999 festival, I’ve been in awe of Ellen Primack’s skills in making things work out so well behind the scenes. Hats off to everyone at Cabrillo for another great success of a season! Last night we attended our first concert at the Music@Menlo Chamber Music Festival to hear mezzo-soprano Sasha Cooke sing spirituals, some of Bolcom’s Cabaret Songs, and Barber’s Op. 13 songs – the set that includes Sure on This Shining Night. This was part of the festival’s closing “Dvořák’s America” program which included Dvořák’s American Quartet and Quintet. The string playing was fine, especially in the closing Quintet, but as singers our focus was on the amazing Ms. Cooke. The first time I heard Sasha Cooke sing was last year in the San Francisco Symphony’s semi-staged performance of Gilbert & Sullivan’s Iolanthe. Ms. Cooke had the title role and was just outstanding vocally and dramatically. She totally nailed her closing “He loves!” aria, which to me is perhaps the most single spine-tinglingly beautiful moment in the entire G&S canon. That performance had some curious amplification – much to the displeasure of the starring Lord Chancellor, Richard Suart, and perhaps other cast members as well. So I couldn’t be sure of how great she was, but I had a pretty good feeling about it. That feeling was confirmed when my wife (also a mezzo-soprano) and I heard her sing Berlioz’s Les Nuits d’été with Michael Tilson Thomas and the San Francisco Symphony in June. I’ve heard these songs both live and on recording with some pretty famous singers, but the cycle as a whole had never really grabbed me. Individual songs like Absence are outstanding, sure, but the cycle has a lot of pretty slow songs that can blur together. Cooke made great dramatic sense of it, giving each song its own characterization and distinctiveness, but in a totally natural-sounding way. Some excellent solo singers have trouble being heard in the vastness and acoustic imperfectness of Davies, but this was no problem for Ms. Cooke at any dynamic level. There are times when you can tell from the audience that MTT is having even more fun than usual, when a performance is just spectacularly good. This was one of those times – he was really radiating throughout the cycle. At the end during the applause, he knelt down and kissed the hem of Ms. Cooke’s gown. We’ve been subscribing to the San Francisco Symphony ever since we moved here, which was MTT’s first season with the Symphony, and we’ve never seen that before! So the very next day we booked the tickets to last night’s Music@Menlo concert. I was thinking the Barber and Bolcom were pretty sure to be outstanding, but I was skeptical about the spirituals. Those were what opened her part of the program, and they were incredible. She was totally into the style, with the dialect and tone just right, but still with her personality. She was literally jaw-droppingly good, and demonstrated even more versatility than ever. The Bolcom songs were indeed outstanding. After intermission were the Barber songs, and perhaps it did these songs no favors to hear them after the others. I love them, but their poetic language makes them less immediately accessible to the audience than the much more vernacular spirituals and Bolcom. They are also tricky songs, and this was the only time where you could perhaps detect a little bit of singer’s calculation about getting everything just right. But that’s in part because Ms. Cooke, unlike far too many other concert singers these days, actually learns her music by heart. I have yet to see her bring music on stage, and of course this frees her both physically and musically to really communicate with the audience. To see and hear her in a real chamber-music sized hall, seating about 120 people, was a special treat indeed. Having heard her sing three times now in three different settings, I am really looking forward to performing with her next year! 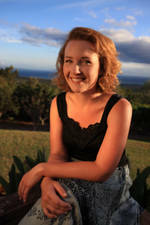 Sasha Cooke will be the mezzo-soprano soloist with the San Francisco Symphony in Mahler’s Symphony No. 2 on May 7 and 8. Tickets are available online now. I will be singing tenor in the chorus. Yes, we just performed this in March, but the Symphony will be taking it on tour next season. So we are reprising it with different soloists; Karina Gauvin will be the soprano. The last time we heard Lorraine Hunt Lieberson sing in person was when she sang the Mahler 2 with the San Francisco Symphony in the set of concerts that led to the orchestra’s recording. Katrina Karnéus sang it fabulously in our March performances. I can’t wait to hear what the amazing Sasha Cooke will do with Urlicht and the 5th movement. Catch this wonderful singer as soon as you can. With any luck she’s just at the start of her brilliant career! Recordare has released its version 5.4 maintenance update for the Dolet 5 for Finale plug-in. The major new features is adding support for Finale 2011. Finale 2011 adds many new features that make scorewriting faster and more productive, including improved lyric entry and spacing, easier staff layout, and improved pickup measures. Version 5.4 adds support for each of these Finale 2011 changes. In addition, we have updated our MusicXML sample files to reflect the latest software. All of our sample files are entered in Finale. They have now been updated to Finale 2011 and exported using either Finale 2011’s built-in MusicXML support or the Dolet 5.4 for Finale plug-in. The biggest change is with the samples from the book Beyond MIDI: The Handbook of Musical Codes. Thanks to Craig Sapp’s work at the Center for Computer Assisted Research in the Humanities, the CCARH site now includes full-size, high-resolution versions of each of these examples. This has allowed us to create MusicXML 2.0 versions complete with MusicXML 2.0 formatting information. The formatting is approximate, given that these samples are exported from Finale re-creations rather than the SCORE originals, but the results are still good enough for sample purposes. This should be a big improvement compared to the MusicXML 1.0 files that we previously had available. Recordare has released version 5.3 maintenance updates for both the Dolet 5 for Sibelius and Dolet 5 for Finale plug-ins. Version 5.3 of Dolet for Sibelius adds better export of lyrics that were originally created by importing a MIDI or PhotoScore file into Sibelius. Version 5.3 of Dolet for Finale includes eight bug fixes that make MusicXML import and export more accurate than ever, including improved support for simplified chord spelling. These updates are free for current Dolet 5 customers. Both plug-ins are available at the Recordare Online Store, with upgrade discounts available for Dolet 4 users. Recordare’s Dolet plug-ins for Sibelius and Finale improve on the MusicXML support provided by these music notation editors. Dolet 5 for Sibelius lets you export MusicXML files from Sibelius. Sibelius will import MusicXML files out of the box, but it does not export them. Dolet 5 for Finale improves the MusicXML import and export available out of the box in Finale, including new features and more frequent bug fixes. Next week will be my last set of concerts with the San Francisco Symphony Chorus for this season. We will be singing Bernstein’s Chichester Psalms and Ravel’s Daphnis et Chloé. The concert opens with Stravinsky’s Ode, written in memory of Natalie Koussevitzky. Michael Tilson Thomas will conduct. Originally the first half of the concert was supposed to be Stravinsky’s Threni. Due to immigration and visa problems, the UK-based solists EXAUDI had to cancel, so the program changed. You may have heard the chorus sing Chichester Psalms to conclude last month’s Spring Choral Concert, but that was the reduced instrumentation for organ, harp, and percussion. With full orchestra it is even more glorious. The Ravel of course is one of the most beautiful works ever written. The Suite No. 2 that is often done comes from the third act of the ballet. In this concert we are doing the entire wonderful score. Performances are May 19, 20, 21 and 23 at Davies Symphony Hall. The weekday concerts are at 8:00 pm and the Sunday concert is at 2:00 pm. 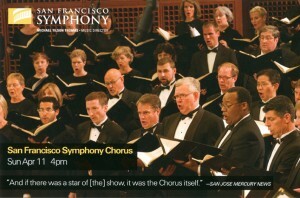 Tickets are available online at www.sfsymphony.org and at the box office. MIT will be hosting its 3rd annual Herb Pomeroy Memorial Concert this Saturday, May 8 at Kresge Auditorium at 8:00 pm. As with the first memorial concert two years ago, this one will feature both the Festival Jazz Ensemble an MIT Alumni Jazz Band. Many of the alumni played under Herb’s direction when he led the FJE from 1963 to 1985. Fred Harris will conduct. 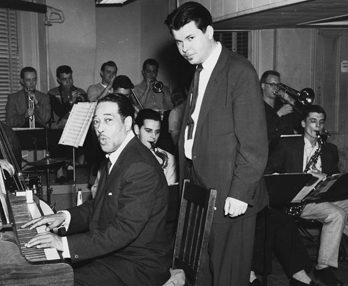 Herb performed with Duke Ellington – see the great picture of them together – and Duke’s music was a huge influence throughout his life. He taught courses on Ellington’s music at Berklee, and his big band had many Ellington charts in their book. The concert will include the Festival Jazz Ensemble playing several of the Ellington works most closely associated with Herb and his band. These include A Tone Parallel to Harlem and Star-Crossed Lovers, both of which I recall hearing the band play several times at the Scotch ‘n Sirloin in the North End over the years. Of course Herb was also associated with discovering, teaching, and nurturing new talent, and several of his former students will have works performed at this concert. Jamshied Sharifi was Herb’s choice to take over the MIT FJE upon his retirement. His new work The Darkening will be premiered at the concert. The concert will also feature music by another former student of Herb’s, Magali Souriau, and by Herb’s longtime trombonist Phil Wilson. As with the last concert featuring the alumni band, I will be attending this one in the audience, not on stage. I played in the FJE trumpet section for four years under Herb’s direction, but switched from trumpet to voice a few years after leaving MIT. This was a tempting gig, so over the holidays I tried to see if I could get my chops back, but that was just not going to happen. Since I had mentioned the possibility of playing in the band, Fred included me on the e-mail with the two charts that band would be playing. I downloaded my 5th trumpet part to the first chart, which was 5 pages long. Page 1 sounded pretty good, but it was all gone by page 2. That’s my trumpet playing these days: still a nice range and tone, but with an endurance of about two minutes. If you’re a jazz fan in the Boston area, come enjoy this special evening by a top collegiate jazz band. Tickets are $5 at the door – a great deal for such fine music. See you there! The combination of work and chorus rehearsals has kept me from this blog. But I really need to let you know about Sunday’s San Francisco Symphony Chorus concert conducted by Ragnar Bohlin, just 16 hours from now. This is the chorus’s annual concert without the orchestra – a mixture of a capella works, works for chorus and piano, and works for chorus and a small number of instruments. Some works call for a smaller chamber chorus, others for a larger group, so there is a diversity of both choral and instrumental textures throughout the program. This year’s concert features a lot of music that is new to most people in both the chorus and the audience. The first half is a selection of Swedish music, made possible through a grant from the Barbro Osher Pro Suecia Foundation. The concert starts with the premiere of Fredrik Sixten’s Let There Be, commissioned by the San Francisco Symphony. The chamber chorus sings this, so I’ll be hearing it for the first time at the concert. The first half continues with Ludvig Norman’s Jordens oro viker, Ingvar Lidholm’s … a riveder le stelle, Sven-Eric Johanson’s Fancies II, and concluding with Two Folksongs set by Lars Edlund. The second half of the program starts with selections from Rachmaninoff’s Vespers sung by chamber chorus, and concludes with the organ / harp / percussion version of Bernstein’s Chichester Psalms. Of the Swedish pieces that the full chorus is singing, I think the Lidholm is the clear-cut standout. It’s also the one piece on the first half that the SFS Chorus has sung before. A setting of the final lines of Dante’s Inferno, it captures Dante and Virgil’s ascent back to the world of light “to behold once again the stars”. The work is a tour-de-force of 20th century choral writing. The soprano, tenor, and bass sections sometimes have 8-way divisions (the altos, alas, just 4-way), and at any one point in the score there may be 16 independent lines throughout the chorus. This is used for many effects: tone clusters and dissonant harmony depicting the Hellish scenario, great bitonal washes of sound, moving toward a gorgeously consonant conclusion as the journey ends. This score is also a textbook example of how to write dissonant counterpoint for a chorus. In the Music at MIT Oral History interviews, John Bavicchi expounded on this very topic – which he is quite expert on as both a composer and chorus conductor. The techniques that Bavicchi describes are just what you hear used in the Lidholm – such as starting with a unison / consonance and going from there to the more dissonant material. I hope to blog about this in more detail in a future post. It should be an exciting program full of new discoveries plus some more familiar favorites. The concert is at 4:00 pm on Sunday, April 11 at Davies Symphony Hall. Tickets are $20 and $30 and will be available at the box office starting at 2:00 pm. And then after one day off, rehearsals start on Tuesday for Ravel’s Daphnis et Chloé, with Michael Tilson Thomas conducting. The professional choristers will also be singing Stravinsky’s Threni on the first half of the program. Performances will be May 19, 20, 21, and 23 at Davies Symphony Hall. Last month, Recordare released version 5.2 maintenance updates for both the Dolet 5 for Sibelius and Dolet 5 for Finale plug-ins. Version 5.2 of Dolet for Sibelius adds support for Sibelius’s Focus on Staves feature when used with Sibelius 6. Version 5.2 of Dolet for Finale includes three bug fixes, including a couple of rare situations that could cause export to fail.